Unicorns are taking over the world right now! My little girl can’t get enough of them! 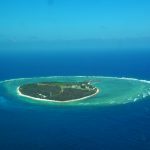 Thankfully there are many things on the market to help accomodate such infatuations! 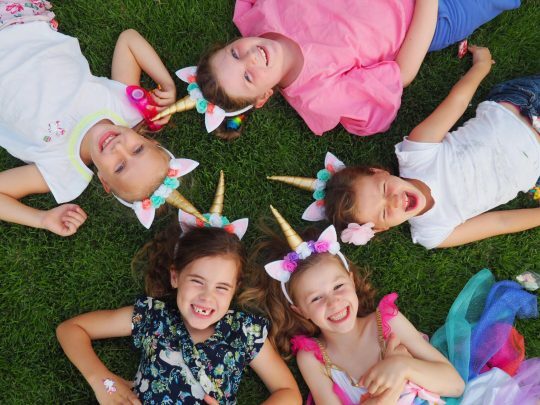 When my daughter asked if she could have a Unicorn Party this year, I said ‘why, heck yes darling’! I love Unicorns myself! I got to planning! I knew I didnt want to spend an absolute fortune, so my first stop was of course The Reject Shop. I was overwhelmed by how much Unicorn themed things they actually had! 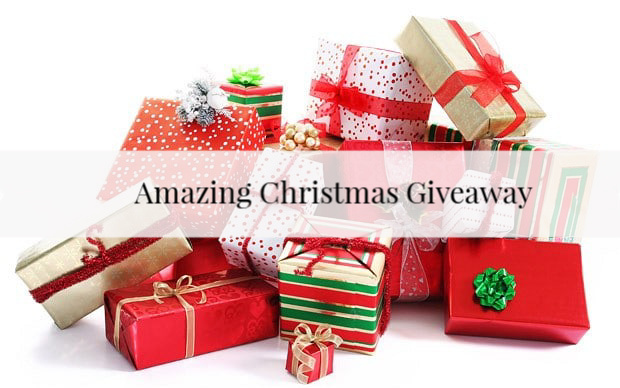 From toys, to partyware, lights, craft kits and even Magical Unicorn Poo! 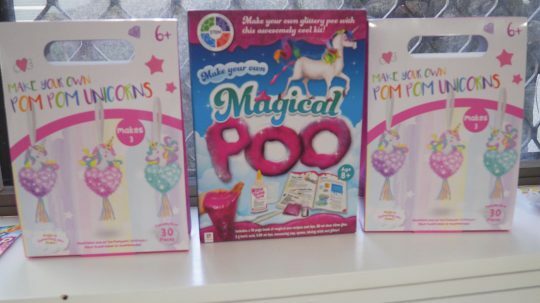 That’s right – combining my daughter’s two favourite things…Unicorns and Slime (you didn’t think I was going to say Poo did you). 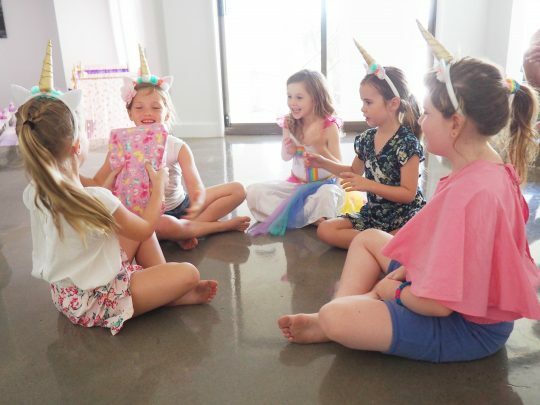 I’m going to show you how I put together an amazing Unicorn party on a budget! The way to set the tone for a good party, it a good invitation! These invitations look complicated and hard to make, but trust me, they are not! I bought everything I needed from The Reject Shop so you know it’s for a savvy price. So now it’s on to the party table! I have a wonderful friend from Sublime Cakes and Sweets who made the cake and cookies. Aren’t they just adorable! Once I knew they were sorted. I started putting together my decorations. 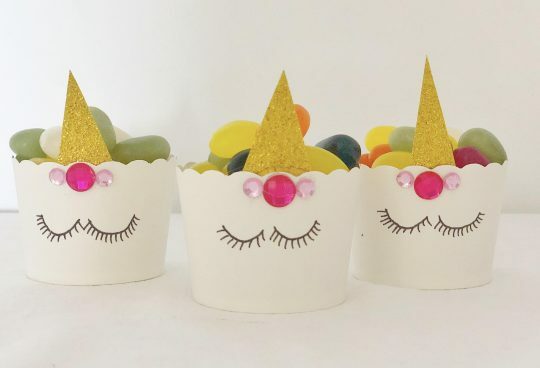 I made these adorable Unicorn Cupcake ‘goodie holders’ out of plain white cupcake papers, gem stickers, gold cardboard – all purchased from The Reject Shop. I then cut small triangle shapes from the gold card and glued them to the inside of the papers to form the Unicorn Horn. I then glued the cute little gem stickers and drew on the eyelashes with a sharpie. 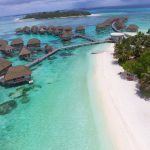 Easy, affordable and adorable! I used a similar concept for these ‘partyware holders’. I purchased the cup from – you guessed it The Reject Shop for $2 (they’re actually bathroom toothbrush holders). I then used used the same gold cardboard to form the Unicorn horn and glued that in place (I recommend a glue gun by the way). I then glued on some floral decorations and gems and again, used the sharpie to draw on the eyelashes. So easy! They’re now used in my daughters room to hold her hair clips. The Reject Shop has so many beautiful stickers, gift tags and cutesie craft products available. 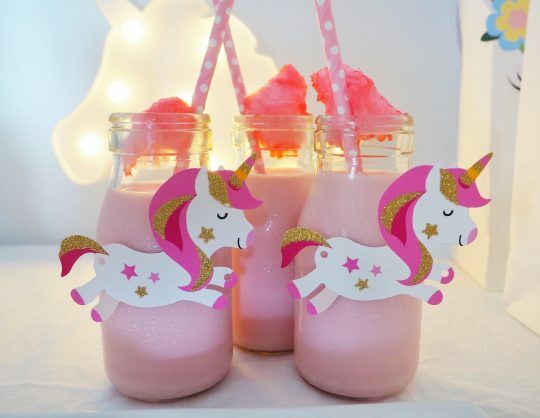 I used these gorgeous Unicorn gift cards as decoration for my strawberry Unicorn Milk drinks…aren’t they sweet! 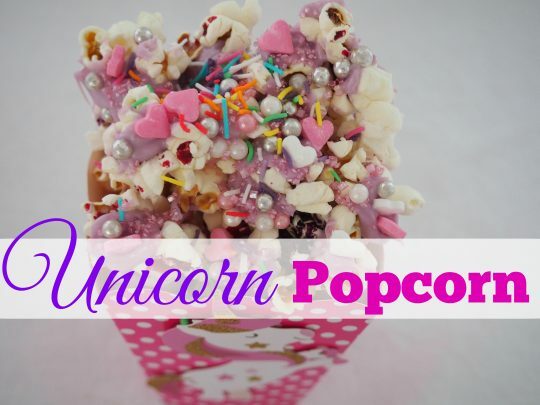 I also used the Unicorn gift cards to make my popcorn treats extra cute! 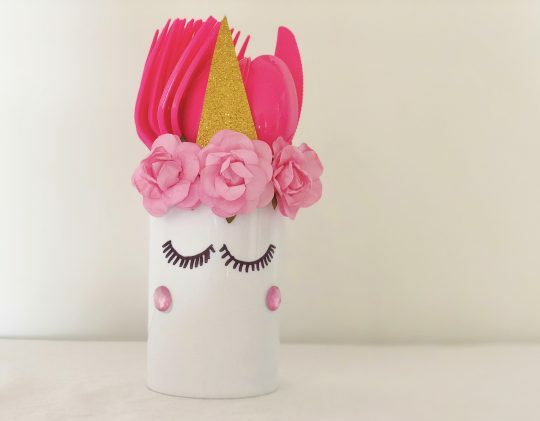 Add the set popcorn into pretty popcorn containers and adorn with sparkles! 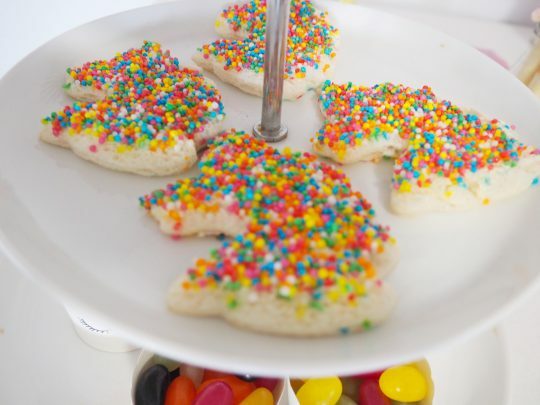 You can’t have a party without fairy bread! 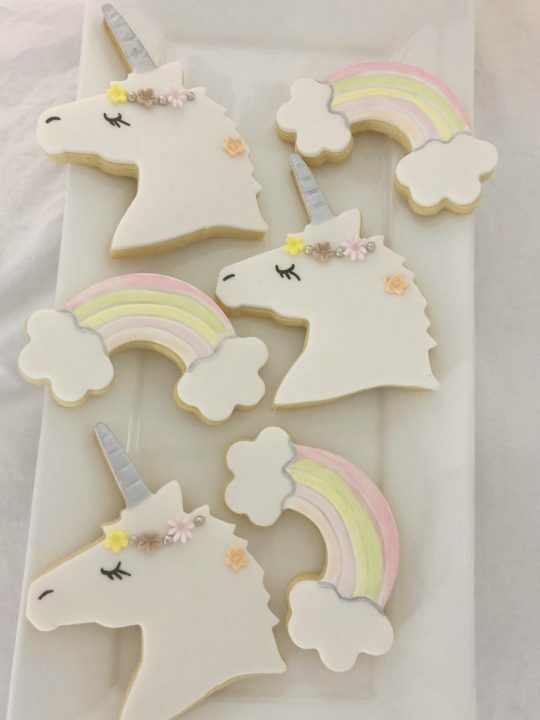 I bought a Unicorn Cookie Cutter from The Reject Shop for $2! So simple and pretty! 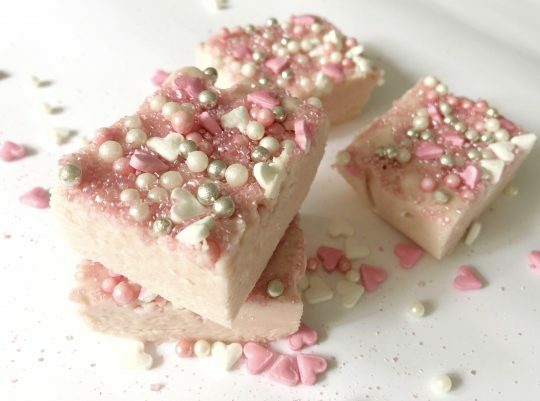 I also made ‘Unicorn Fudge’. This was made with, wait for it, only TWO ingredients! Refrigerate for at least 1 hour then slice! For the party bags, I bought a pack of plain white party bags from The Reject Shop then ordered some printables from the ETSY store Creative Party Studio. Simply print and stick them on! I also stuffed them with pretty tissue paper and added some super cute goodies – all available from The Reject Shop. 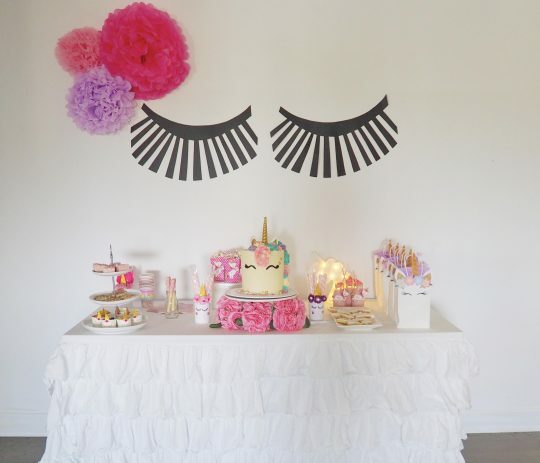 To create my Unicorn Eyes and headpiece for my party table backdrop, I bought some pre made ‘Fluffy Flowers‘ and black cardboard from The Reject Shop. The fluffy flowers simply come out of the packet ready made, you just need to fluff them and stick them to the wall! I drew on and cut out the shape for the Unicorn eyelashes from the cardboard and traced that onto the second piece. Super easy and very effective. 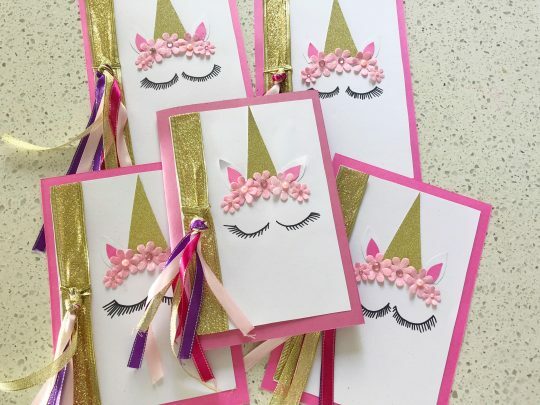 The Reject Shop has some adorable ‘Pom Pom Unicorn’ craft packs right now…for only $5! Check out the video below of them being put together – aren’t they adorable! 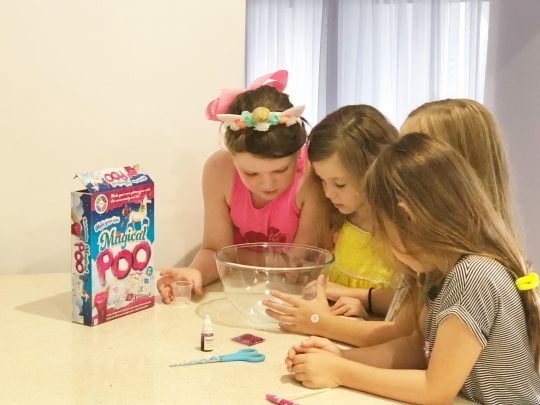 The girls loved making ‘Unicorn Poo’ er um, Slime! It was one of the highlights of the party for them. You can purchase said ‘Poo’ from The Reject Shop. It even comes with a booklet with plenty of other slime recipes too! We also had a great pass the parcel game. I made sure each layer of wrapping had a gift inside so each girl got to take home something special. I bought all of the gifts from The Reject Shop. 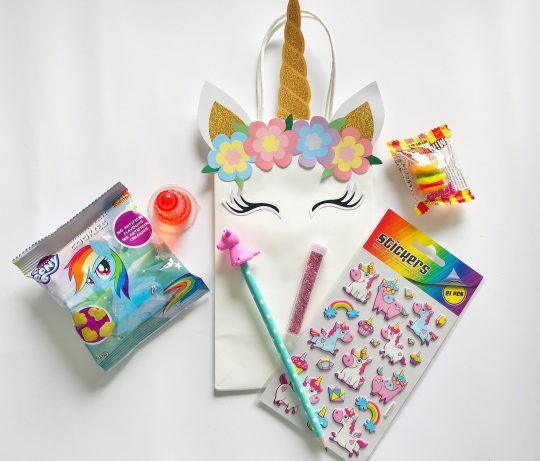 There were craft kits, sharpeners, stickers and even a Unicorn diary. I must admit, my absolute favourite thing of all were these gorgeous headbands! 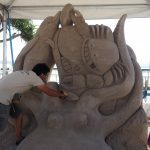 I have seen so many YouTube videos on how to make these yourself at home and it really is quite the process. When I saw these pre made headbands from The Reject Shop I knew I was on to a winner. All I had to do was glue all the pre made pieces together! The girls squealed when I handed them out. Such a great party favour! 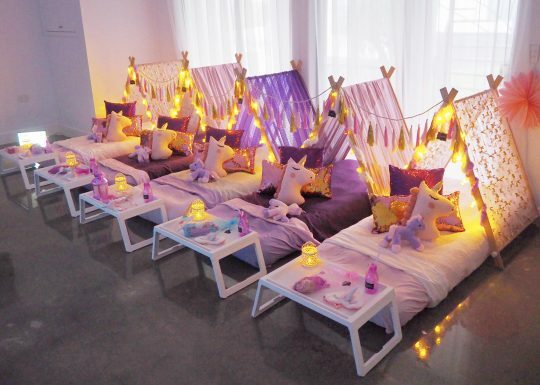 I was very lucky to have the lovely ladies from Slumber Party Tents come and set up this magical Unicorn wonderland too! 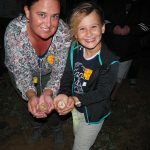 The girls just loved having their own individual ‘tent’ to sleep in. I wish these were around when I was a little girl! 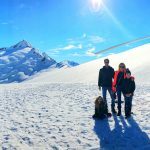 Talk about making memories. You can learn more about Slumber Party Tents and see more of our gorgeous photos here. 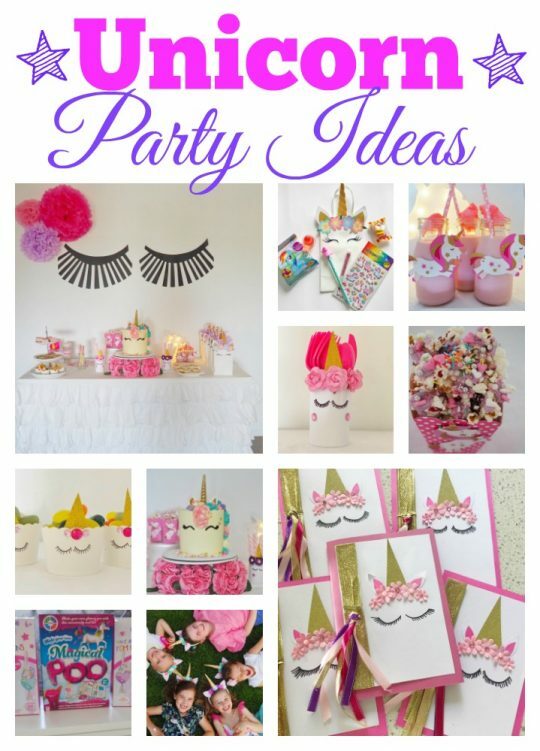 I hope you got a few hints and tips on how to host a Unicorn Themed Party on a budget. I know I had an absolute blast planning and putting together this party. 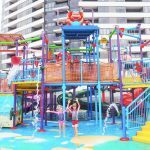 I want to say a huge thank you to The Reject Shop, with amazing sponsors supporting us, we can provide you with all of the information you need to have fun with your kids! Make sure you go say hello to the people at The Reject Shop and check out their amazing affordable range! 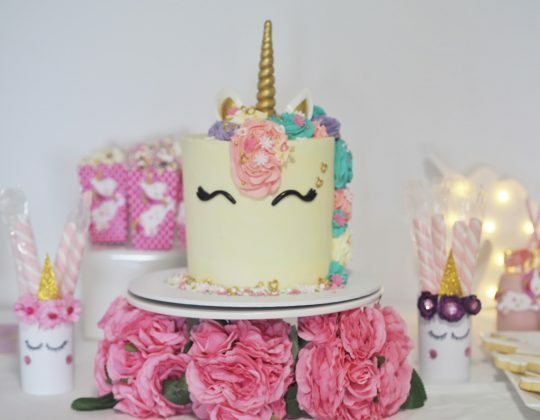 OMG This is perfect Just in time too my friend is having a birthday party and her theme is slime and Unicorns thank you so much you read my mind!!! 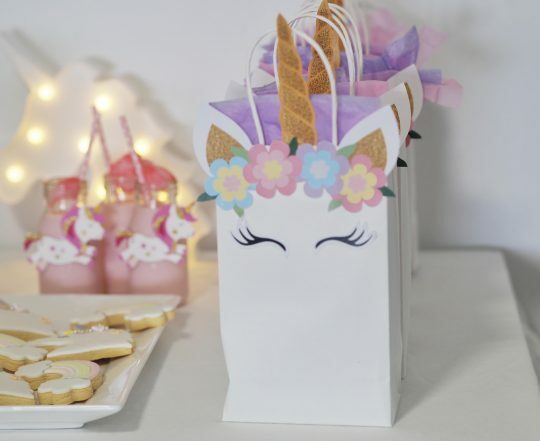 Love the invites and the unicorn fudge! I’m going to attempt both next weekend for my daughter’s party! Thank you!